I used to be the queen of fabric paint back in the day. You don’t even want to know how many of those painted shirts that I had as a tween-aged girl. Many of them I had made, and some of them my grandmother had even made for me. Haha! Those were the days for sure. Fabric paint has come a long way since the 90’s, and it’s been making a comeback over the past few years. 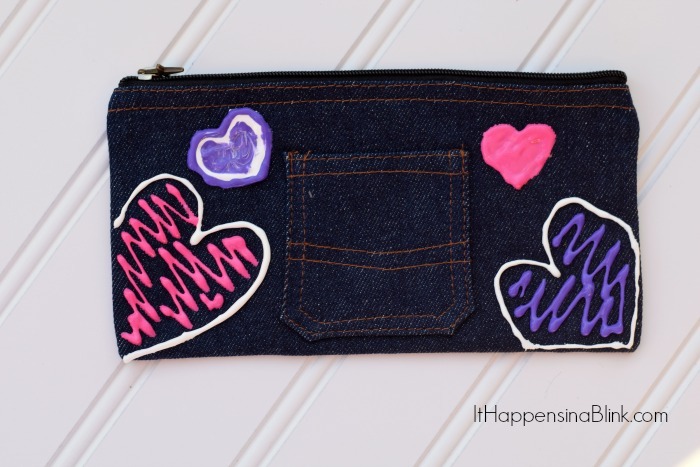 When I found these cute denim pencil pouches at Family Christian Stores, I immediately knew that I wanted to turned them into an Embellished Pencil Pouch and reacquaint myself with my fabric painting skills! This would make a great tween or teen craft. A big thanks to Family Christian Stores for supplying the pencil pouches today and for sponsoring the giveaway! For me, it’s always easiest to start in a corner. I began with a heart. From there, it’s literally all up to you! Get as creative and crazy as you want! Have a favorite or inspirational Bible verse? Add it to the pouch as a daily reminder! Let the paint dry overnight. You’re ready to go! 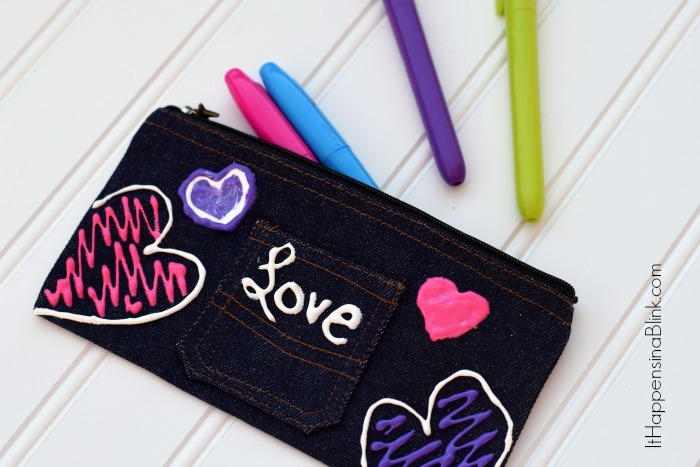 Utilizing pre-made pencil pouches is a great alternative to those who aren’t comfortable sewing but want to get crafty, too! 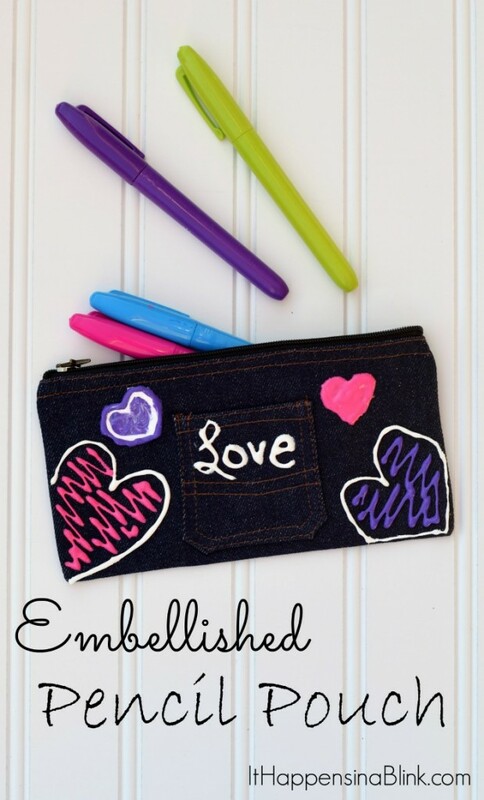 Want to grab a few of these pencil pouches for a tween/teen project? Family Christian Stores is giving away a $10 Appreciation Certificate to one lucky reader! Use the below Rafflecopter form to enter to win! This giveaway is open to those in the US. Winner will be chosen at random from all eligible entries. Prize sponsored and fulfilled by Family Christian Stores. Giveaway open through 11:59 pm on 2/6/15. I loved using fabric paint and I still do. I love these little pouches. I’ll have to see if our FC store has them. It would be a fun project! 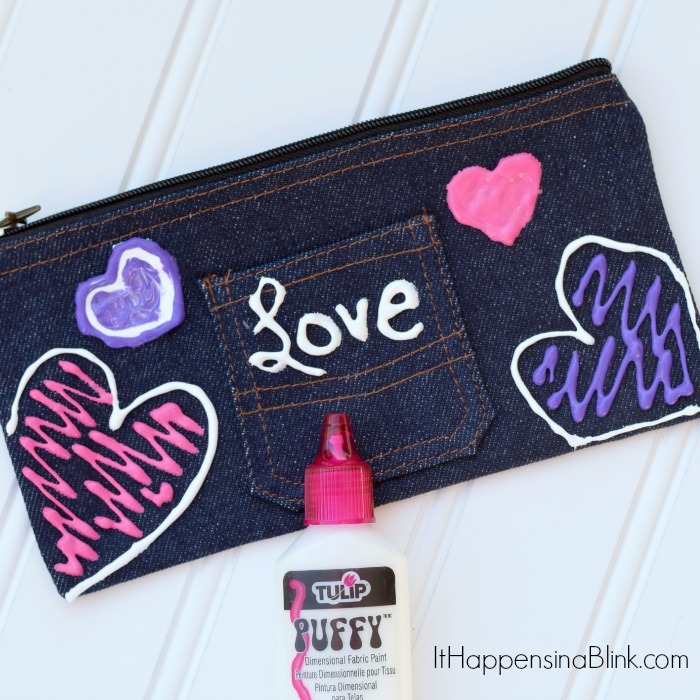 Puffy paints are such a fun way to embellish so many things! LOVE your pencil pouch! I never have but my very artistic and craftsy teen daughter has and does! We used Tri-Chem paints for fabric painting. Everything from t-shirts to wall decor. Yes, I did use fabric paint. I wrote on a sweatshirt in neon colors. I made a ton of sweat shirts embellished with puff paint when I was a kid!! I don’t think I’ve ever used fabric paint — but my 3 daughters love it!